Right lads, you’ve been growing your face beast now for a while, and you want to start trimming that bad boy. Trimming your beard is an essential part of growing your beard. Even if you’re going for that Yeard (Year Long Beard), you still, in my opinion, should be keeping it tidy by trimming it on a regular basis. But remember, if you’re growing your beard out, then I don't recommend you start trimming until at least 6 weeks into your beard growth. Have you already had a go at doing it? Did it go well? For me, it took a LONG time to get it right. I can’t tell you how many times I’ve trimmed too much off or got the neckline completely wrong. 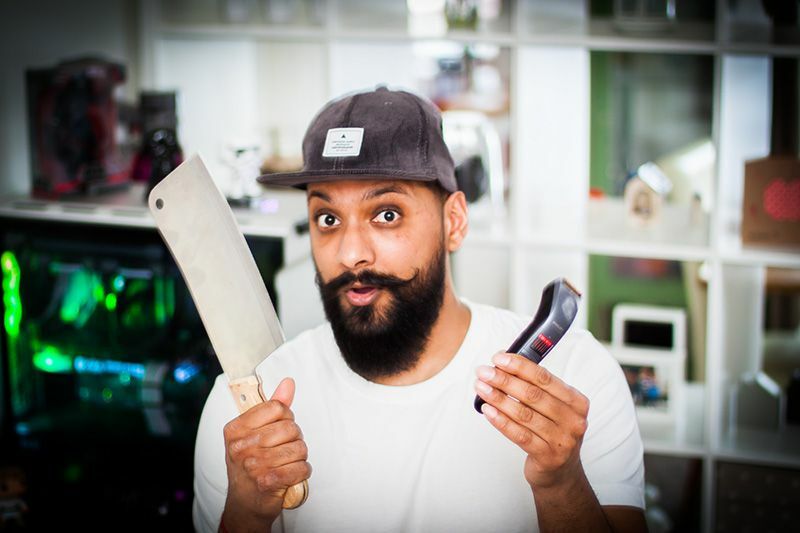 It can be daunting for a beginner, but I’m here to help and show you how to properly trim your beard and facial hair with the right tools. That’s right fellas, this article is going to give you the low-down to this very question and hopefully give you the confidence to trim like a pro! What’s the look you’re after? First off, before you do anything, you need to decide the style you're going for. This is a key step in the process because it’s going to allow you to understand what equipment you might need. Going for a short and tidy beard? You might only need a beard trimmer for this. Going for a long, full beard? As well as a beard trimmer, you might want to invest in some nice scissors. There are so many factors that go into how different styles suit different people. Maybe there’s is a celebrity look you like the look of, or your barber has the frickin' awesome beard that you've always wanted. Whatever your reason, make sure you choose something that suits your personality and face shape, but also how far you want to go with your beard. If you want to go long, you need to consider the maintenance that it needs. I can’t tell you how many times I’ve seen guys with beards that just look like s###! (excuse my french). Something you might not be aware of is that the best beard style for you could be down to one simple fact. Face shape! Now if you have an oval shaped face then you’re pretty much sorted as you can pull anything off. Nice one! But, if you have, for example, a more rectangular shaped face, then you should be looking to grow a beard with a focus on filling out your cheeks to stop your face looking too elongated. 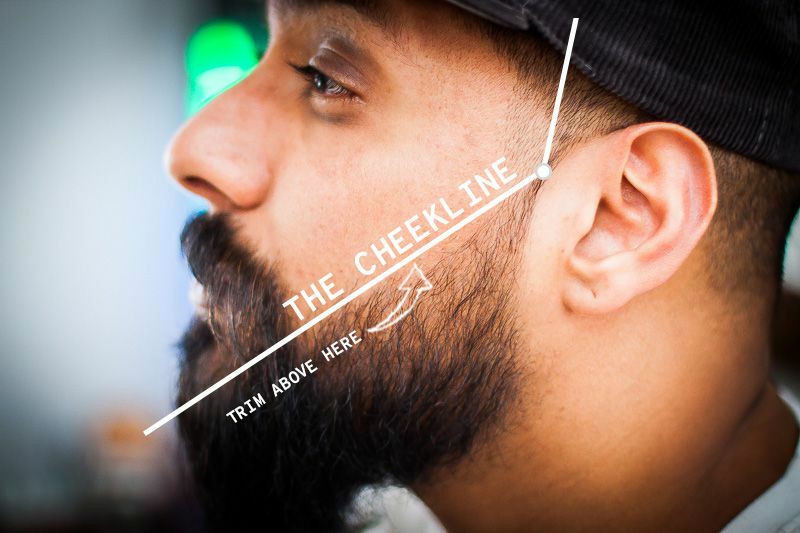 Check out this article over at Fashion Beans on the right beard for your face. It’s a cool read and you’ll soon have an idea of what style you want to rock. Now you know your face shape and you’ve nailed the style you want to go for, you’re ready to go. Before you do anything else, you need to get the right gear. I recommend that you start with a decent beard trimmer and a beard brush, but this depends on what style you’re going for. If your style is a long beard, you probably want to be using some scissors and a beard comb. On the other hand, if your look is more of a shorter beard, then you can get away with a beard trimmer and maybe a beard brush. It’s pretty obvious, but I see so many chaps go out and buy really cheap gear and end up with all sorts of problems. If you’re really serious about keeping a good beard, then invest in something decent. Get the best that you can afford. Firstly, pick yourself up a nice pair of scissors and a comb. I personally use this Gentleman's Face Care Club Scissors from Amazon. I highly recommend them. I’ve also said it before in other articles, and I’ll say it again, Kent, in my opinion, do the best combs. You can pick up a Kent Comb from Amazon. You probably know this already, but there are so many trimmers out on the market. Now with it being such a competitive space, it can be a stressful task just finding the right one for you. But there are few things you need to consider when picking one out. Price - You need to set a budget and stick to it. Length settings - This is a crucial consideration. I can’t tell you how many times I bought a trimmer and then realised that it doesn’t have the right setting for the length of beard I’m going for. Check out the length guide infographic below. ​​​​​​Size - Do you need it to be compact? Do you travel a lot? If you do travel, you might want a trimmer that's easy to carry onto a plane in hand luggage. Charge time - This would affect the cost and something to consider in your budget, but also if you’re on the move, you might want a cordless trimmer that has a quick charge time for the convenience. Read up on reviews, get recommendations from friends, but do your research. 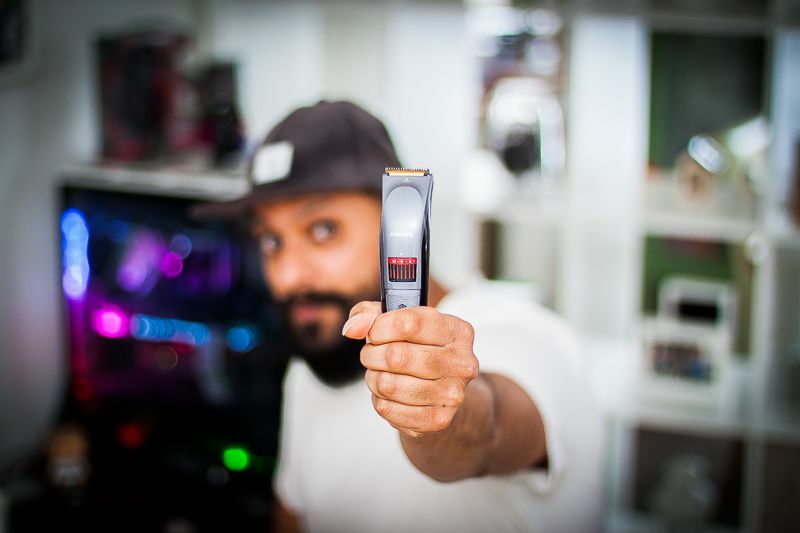 I’ve pulled together my top 5 beard trimmers, which might help with your decision making. With most trimmers, you get a supported length range. But, I bet you ask yourself, what do they all mean!? What setting should I be using? Disclaimer - This is just a guide and different manufacturers might have different meanings for their settings. Just to be sure, I always go with the actual length and not the guard number. Now we’re ready to start trimming. One of the biggest mistakes that guys make is getting the neckline completely wrong. Let me tell you from experience that it’s not a good look. I’ll put my hands up and admit that I made this mistake for years before I really started to research male grooming. So what’s a good neckline? Having a good neckline can really give you a well-defined beard. I would say that the difference between a good and a bad neckline is massive. If you look at the picture above, you will see that you’ll need to imagine a curved line that travels from behind your earlobes, under your jawline, that’s roughly 1.5 inches above your Adam's apple. Sometimes it’s easier to place two fingers above your Adam’s apple, which can be used as a guide. Once you have got a good idea on the neckline shape, you can begin to trim all of the hairs that fall outside of this area. It’s always best to ensure that you keep your neckline curved under your jaw to keep it looking natural. Remember, practice makes perfect. You might not get it right every time, but there's trial and error in everything we do. How do I know if the neckline is bad? On a serious note, like I said, you need to practice. If you do get it wrong and trim it too high, then it will give a false impression that you have a double chin. Not the look you’re after fellas! You can check out some examples of bad necklines over on Pinterest. Just remember that you need to have your neckline roughly 1.5 inches above the Adam's apple; any higher and you’ll have problems. If you’ve got a good neckline, then it will appear very natural looking, with a nice curve under the jaw. Check out the pic above. When you move to the cheek line, you kind of need the opposite to the neckline. With the neckline, we don't want to go too high, but with the cheek line, we don't want to go too low. Unless you’re going for a specific look, I would recommend you don’t cut your cheek line too low. Trust me, it’s not a good look. The image above shows you the line you’re looking for. It's very simple, you want to picture a line between the top corner of your sideburns to the corner of your moustache, then simply trim away the hair above. Have you got a short beard? If you’re rocking a short beard, then I would recommend using a beard trimmer. I love using a good quality pair of scissors to trim my beard, but a shorter beard is easier to trim with a beard trimmer. Also, if you’re going for that stubble, AKA the Jason Statham, then doing that look with a pair of scissors isn’t gonna cut the mustard. Here are some top tips on how to trim the perfect short beard. Always start with the longest setting on your trimmer. I can't stress this enough. I can’t tell you how many times dudes have told me that they went too low because they thought it would be the correct setting, but regretted it big time. Trim up against the grain and ensure you get all the hairs. You can always tell when you’ve trimmed enough hair for that trimming length because the sound starts to sound consistent, like when the trimmer is idling. The important step here is to go down one level at a time. Repeating step one until you reach your desired length. Once you have that length, you’ll remember that setting for your next trim. Once you’ve got to the length you’re happy with, you can, if you’re feeling confident, take the guard off and tidy up those stray hairs. If you’re not feeling that confident doing this then you can always use a pair of trusty scissors to do the job. Remember my top tip. 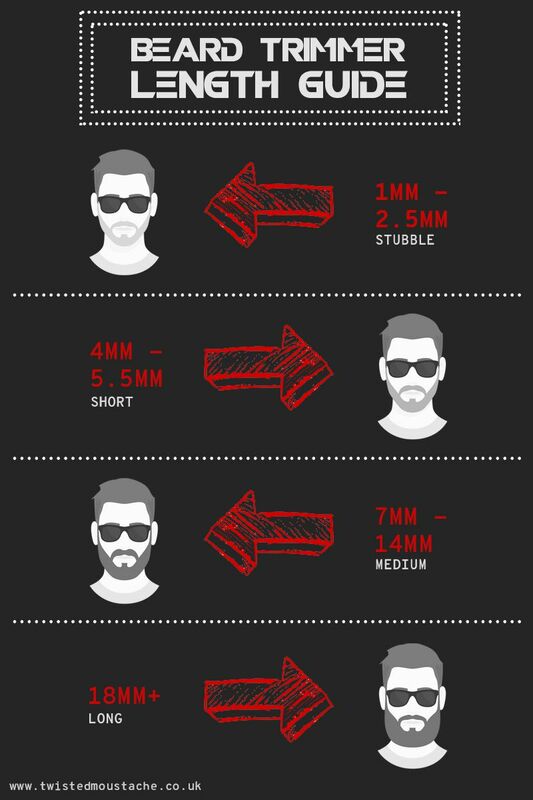 Start at the highest setting and feel free to check back to the infographic above on beard trimmer lengths. What about us long bearded dudes? So you have a long beard, and it’s getting wild. You need to tame that beast. Longer beards are a little trickier, so I would recommend using both a beard trimmer and a pair of scissors. Now if you’re more experienced with the trimmer, you can use the trimmer without the guard to trim away some of the stray hairs. I’ve had a beard for a while now, and my go-to weapon of choice is my trusty scissors. You’ll have more control and there is a better chance you’ll make fewer mistakes with your cuts. I’ve linked up a video below that can give a visual view of how to do the cut, but here are my top 3 tips for cutting your long beard with scissors. Be prepared - Before you cut, make sure you take a good look in the mirror and really take note of what you’re going to do. Don’t try and wing it - you’ll only regret it. Instead try to have a good idea of what you want to cut, how much off the bottom you want to take, maybe you want a square shape, or more of a rounded beard. Have the right gear - I’ve already mentioned above about getting a decent pair of scissors and comb, but for this type of trim I would also advise you get a hand mirror. This will really help you to see the sides of your beard and give you more control over your cuts. Clean it, dry it - It’s always best to clean and dry your beard before you start cutting. I usually also style it before I cut it. If you're like me and you have naturally wavy hair, you might want to blow dry it straight. Now when it comes to actually cutting it, there are some great videos that can really show you how to trim your long beard with a pair of scissors, check out this video. You didn't mention a razor, should I be using one? This comes down to personal preference. For me, I don't normally use a razor when I’m trimming. I find that the beard trimmer with the guard off normally does the trick for me. But I do have a long beard so it works well for me. If you’re going for a short beard, or a stubble look, then yes getting in there with a razor to get that cleaner cut might work better. It’s up to you really. If you want that natural look, then go for the trimmer only. If you want a more defined cleaner look, then grab your razor and get at it. How to keep it looking pukka! After all that trimming, you need to think about maintenance. You need to keep that beard looking sharp. Here are some things you should be doing to keep you face beast in tip-top condition. Beard oil - This is a must, and you should be using this every day on your beard. As well as keeping you looking sharp and giving your beard a nice shiny coat, it helps to keep your beard nourished and also stops that dreaded beard dandruff. Brush Brush Brush! - You need to brush your beard regularly. As well as keeping it neat, tidy and looking good, it helps to keep the skin underneath healthy. If you don’t brush your beard, then the oil can't reach the skin and it will give you beard skin related problems. So, keep brushing. Wash it - I’ve mentioned this before in my guide for growing a beard for the first time, but washing your beard is important. When you’re beard starts to get longer, You'll want to try and keep your beard washes down to just once a week. Don’t blow dry every day - If you’re like me, you'll want to blow dry it and get it nice and straight every day. As much as you want to do it, I wouldn't recommend you do this every single day. Blow drying can damage your hair, especially when you use a cheap hair dryer that doesn't have a variable heat adjustment. If you want to style it, try using some beard balm and brushing and shaping it. 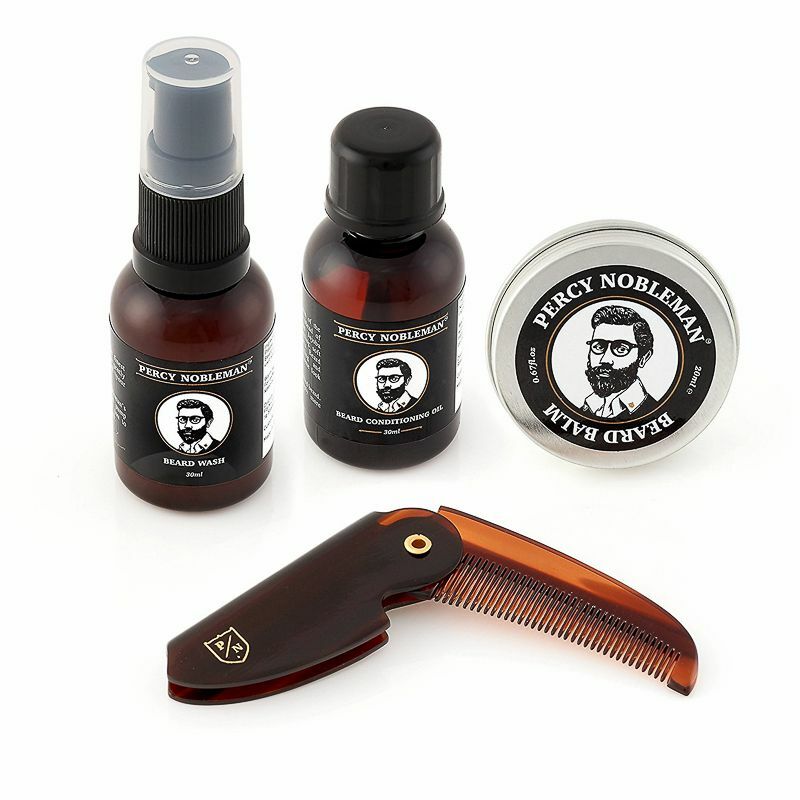 If you're looking for a nice starter kit for beard maintenance, or if you're looking for a gift, then this Beard Grooming Kit by Percy Nobleman is a great option from Amazon. 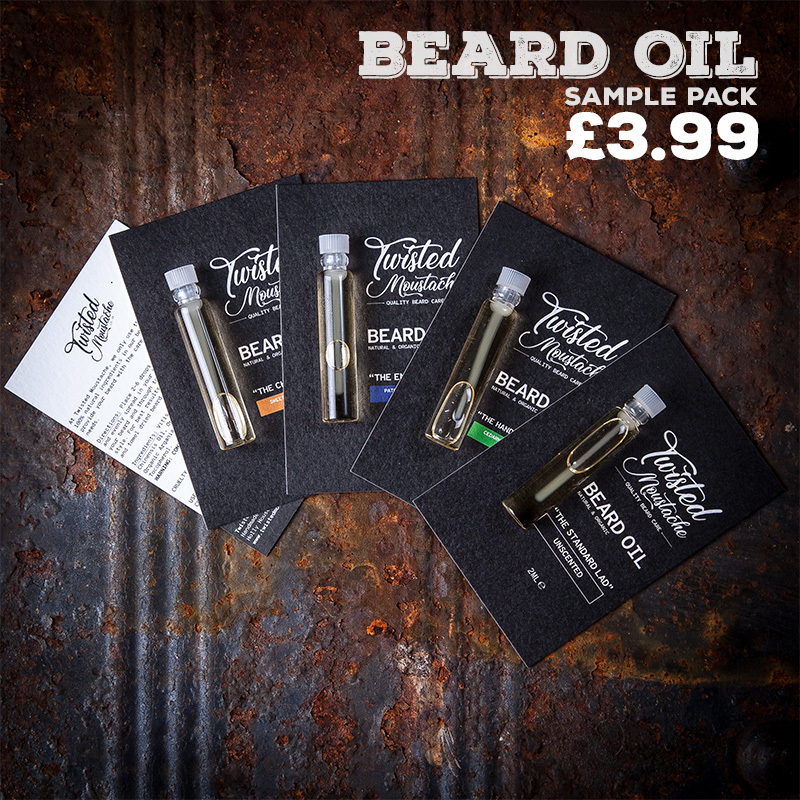 A Beard Oil, Wash, Wax & Comb gift set for men. Drop me a comment and tell me about your beard trimming routine.